This is by far the most delicious recipe for hot cross buns that I have ever tasted. 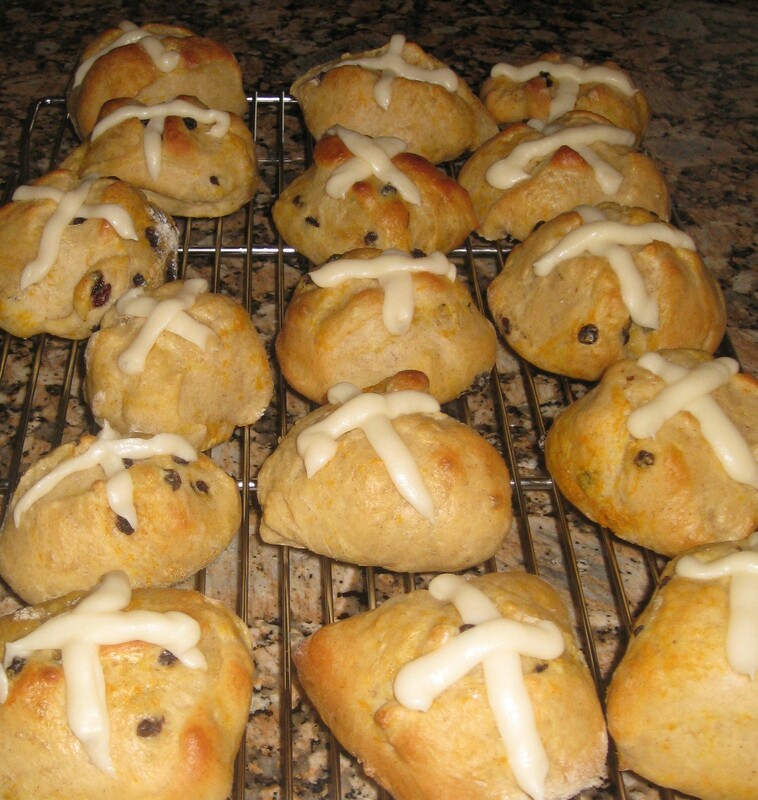 I made these for Good Friday, 2010 and they were amazing. Last year I tried a different recipe that I found on line somewhere, and there was no contest. I am not a bread-baking person, in fact, it intimidates me a great deal. I can honestly say that if you can follow instructions, these are very easy to make. In a large mixing bowl. combine 2 cups of the flour, yeast and cinnamon. Heat the milk, oil, sugar and salt until warm, 115-120 degrees. Add to the dry mixture. Add the eggs. Beat at low speed for 30 seconds, scraping the bowl. Beat 3 minutes at high speed. By hand, stir in enough remaining flour to make a soft dough. Stir in currents and grated orange peel. Shape into a ball. Place the dough ball into a lightly greased bowl, turning once. Cover with tea towel and let rise in a warm place until doubled in size, about 1.5 hours. After dough rises, punch it down and turn it out onto a floured surface. Cover and let rest for 10 minutes. Divide the dough into 18 equal pieces, and form them into smooth balls. Place the balls onto the greased cookie sheets 1 1/2 inches apart. Cover and let rise again until doubled, 30-45 minutes. Using a serrated knife, cut a shallow cross in the top of each bun. Brush the top of each bun with the slightly beaten egg white. Bake at 375 degrees for 12-15 minutes. Allow buns to cool completely before frosting. Mix the butter and powdered sugar and add the rest of the ingredients. Using a cookie press fitted with a frosting tip, or a frosting bag, make a cross on the top of each bun. Allow the frosting to set and then gently cover with wax paper. Do not stack these or the crosses may smudge. I know, I know. Good Friday is a very serious fast day, but you gotta eat something, right? If you’ve given up sweets for Lent, wait and make these on Holy Saturday or Easter Sunday. Your family and guests will be impressed!